Target: 100 % RE by 2030 and climate neutral by 2020. Status: In progress - In 2014, the city produced 30% of its energy needs from RE. RES: Windpower, solar power, and district heating and cooling systems. Implementation: In 2009, the city of Malmö launched the ‘Environmental Program’ in order to: (1) reach the goal of 100% RE, (2) improve the sustainability of the city, and (3) raise the quality of life of its citizens. Environmental goals were set: reduce energy consumption by at least 20% by 2020 and by a further 20% by 2030, and reduce GHG emissions by at least 40%. Furthermore, rail traffic, other electrically driven public transport and the network of cycle lanes will be improved and extended. The Program gives citizens the opportunity to participate in implementation, encourages private investment in RE, and reinforces co-operation with regional stakeholders. Today, he City runs all municipal buildings on 100% RE and has already been reducing greenhouse gas emissions with a focus on energy efficiency, reducing energy use, and investing in renewable energy. Over the past 20 years, the city’s disused brown fields and industrial spaces have been re-developed and revitalised with energy efficient buildings and attractive public spaces. 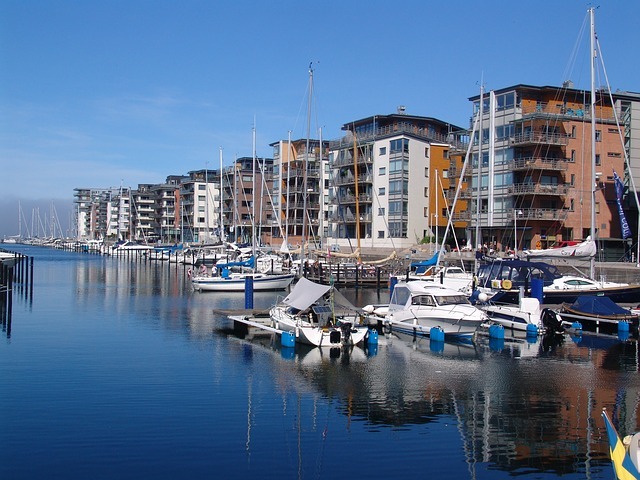 The Western Harbour (Västra Hamnen) with housing estates operates on 100% locally produced RE. The houses are powered by a 2 MWh wind turbine that provides 99% of their electricity and 8 kWh of solar PV. Western Harbor also has an innovative district heating and cooling system. In the summer, cold water from the previous winter, which is being stored 90 meters underground in aquifers, is pumped up by wind-powered electricity and run through a heat pump for district cooling. Once the water is heated it is pumped back down into the aquifers where it is stored for heating buildings in the winter. Furthermore, Malmö is home to Sweden’s largest solar energy plant: Sege Park, featuring 1250 m² of photovoltaic panels.